I squeal with delight when I find our mailbox full of new magazines, handwritten notes from friends, online orders, a West Elm or IKEA catalog, and other fun items. 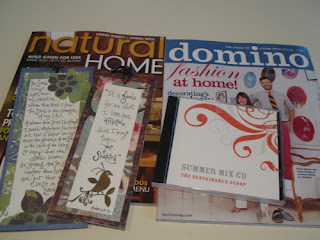 Yesterday's mailbox spoils included new issues of Natural Home and Domino, The Sustainable Scoop Summer Mix CD, and whimsical handiwork by my friend Christine. Let's discuss the CD. One of the many reasons I love writing for Kerry is that she's just so darn cool. We have a lot in common - for example, most of the artists on the Summer Mix CD: Broken Social Scene, Beck, Muse, Beastie Boys (LOVE them so much), The Cars (LOVE them, too), David Bowie, and The Rolling Stones. And then she'll introduce me to either new bands I end up swooning over, or classic groups I should already love: Talking Heads, Dire Straits, LCD Soundsystem, The American Analog Set, The Ventures, and Toots and the Maytals. Who doesn't like a good mix CD? As you've seen in my photographs lately, I spend each morning in the kitchen, seated at the breakfast nook table, inspired by golden light. 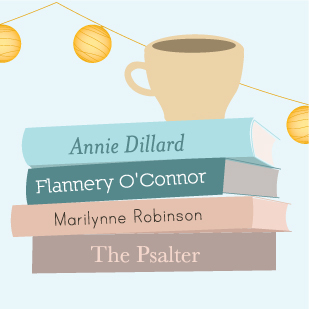 I wanted Psalm 91 to hang directly across from my eyes' gaze as a regular reminder not only of a dazzling Psalm, but also a recollection of God's promises when my brain can only muster doubt. "It is good for me that I have been afflicted, that I may learn Your statutes." "The Lord is my light and my salvation; whom then shall I fear: the Lord is the strength of my life; of whom shall I be afraid? ... I should utterly have fainted but that I believe verily to see the goodness of the Lord in the land of the living. O tarry thou the Lord's leisure: be strong, and He shall comfort thine heart, and put thou thy trust in the Lord." I encourage you to contact Christine if you're interested in her art. She customizes orders and does lovely work, as you can see! 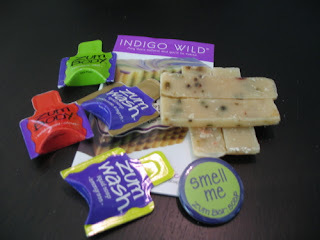 After all of that creative, delightful good, the UPS man dropped off my order from Indigo Wild - frankincense & myrrh mist - and a bag of free samples! I am very interested in the Under Eye Butter and the Lavender-Sandalwood Facial Toner. 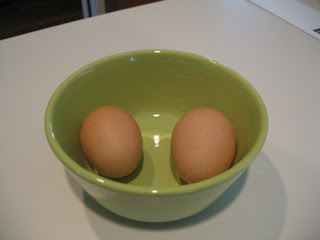 I don't know what the mail will offer today, but simplicity continues to inspire me. 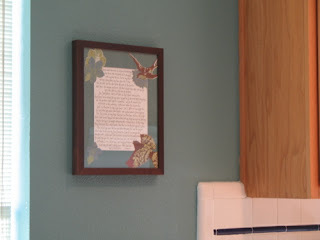 You are too sweet :) I'm so glad the items found a cozy spot in your house and that the matte color matched your walls! 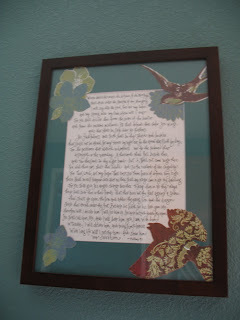 Christine's art is beautiful and the framed Psalms 91 is perfect for you. Thank God for good friends! !